How does the signature get onto ID, membership and payment cards or any other document? Quickly and easily with the digital signature pads Sig100, Sig200, Sig 100Lite and Sig Activ from Evolis: in only a few seconds the customer signature is digitalised and ready for further processing, in high resolution - whether it is for the payment process in retail, for contracts and usage on ID cards, or for customer loyalty and payment cards. Depending on the model there are various touch technologies in operation: resistive displays (which react to any type of pressure) or ERT displays (which are only operable with a special stylus). 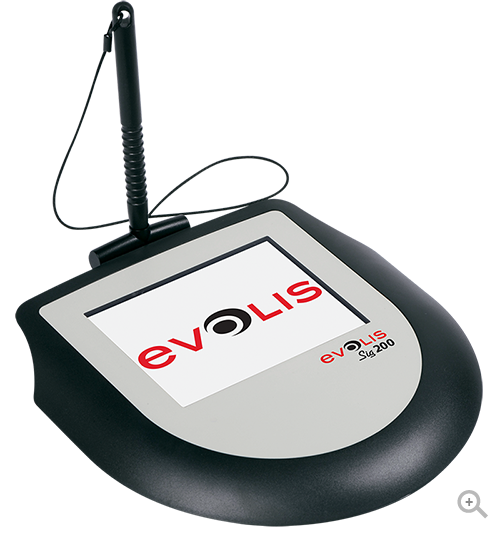 The compact signature pads from Evolis simplify and speed up signature capture, saving on long waiting times, plus offer customers a high degree of comfort. Connection is easy via USB to any common PC. Real Plug and Play makes usage routine for users in banks, maintenance, retail, even in hotel and tourism. When connected to an Evolis card printer you implement the captured signature directly onto an individual customer loyalty or payment card.